This post originally appeared on the Organizational Communication Research Center blog for the Institute for Public Relations. A 2016 Ernst & Young study revealed that 87% of consumers believe companies perform best over time if their purpose goes beyond profit. According to Korn Ferry research, organizations with teams focused on purpose had annual growth rates nearly triple the annual rate for the entire industry. Companies can and should use purpose intentionally to figure out how to run their businesses. For a company like Toyota, their purpose might extend beyond the source of today’s profits—that of manufacturing and selling cars—toward the broader mandate of enabling human mobility. This more expansive, purpose-driven thinking then drives corporate reinvention, enabling the company to ask themselves: Where are we not playing today where we could, to bring this mobility concept to life? Fulfilling their purpose of mobility might entail embracing different spaces like future transport, self-driving cars or electric scooters—even medical devices. Identifying a company’s purpose can already be a challenge. But activating purpose within the organization—getting leaders and employees to embrace that purpose, so that it shapes every aspect of how the business runs—may be the more significant challenge, with higher long-term stakes. 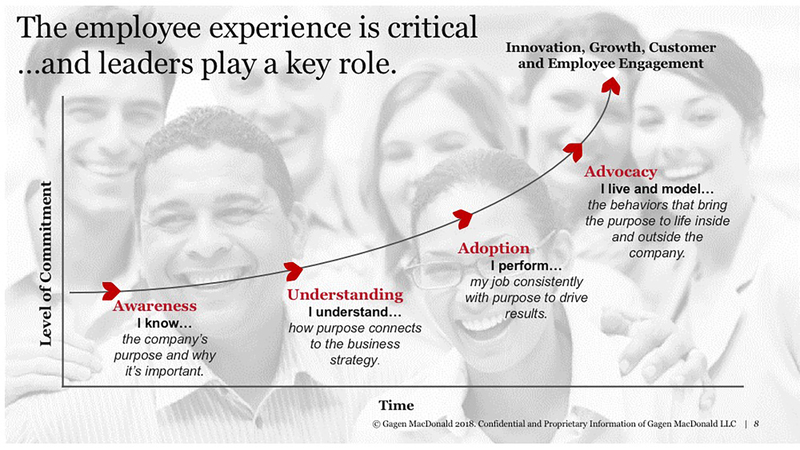 Many companies realize that purpose must inform how they address customers, employees and the community. A 2014 Deloitte executive survey confirms that the top growth activities currently informed by purpose are “providing business services and products that have a meaningful impact on customers (89%) and on society (84%),” providing employees with education and mentoring, and acting as good corporate citizens via volunteering and charitable contributions. At a deeply purpose-driven organization, however, purpose drives necessary transformational change and innovation. Purpose influences the company’s business decisions, defines leadership behaviors, and guides strategy execution. Too many companies get stuck at the initial awareness step—just communicating purpose. Truly living an organization’s purpose requires pushing through to adoption and advocacy. In these later stages, purpose is activated internally by leaders who live the behaviors and make business decisions that reflect the purpose. Business adoption of purpose can and should be measured. At Gagen MacDonald, we begin by diagnosing adoption gaps within a particular organization—areas where the expression of purpose isn’t yet aligned with internal realities. That process involves working with the leadership team to gather insights through a proprietary diagnostic—for example: How does purpose create value for the business? Provide strategic clarity? Contribute to brand authenticity? Influence the experiences of customers and employees? In gathering these data points around critical investment areas that drive purpose, we can reconvene with leadership to assess the current state—how well the company as a whole understands its purpose to date and how it uses purpose actively in decision-making. From here, we build a tailored adoption plan aimed at closing these gaps. As the diagram below indicates, measuring business adoption of purpose means measuring progress towards adoption-specific desired behaviors and practices, elevating individual success stories via recognition, and embracing an iterative approach. 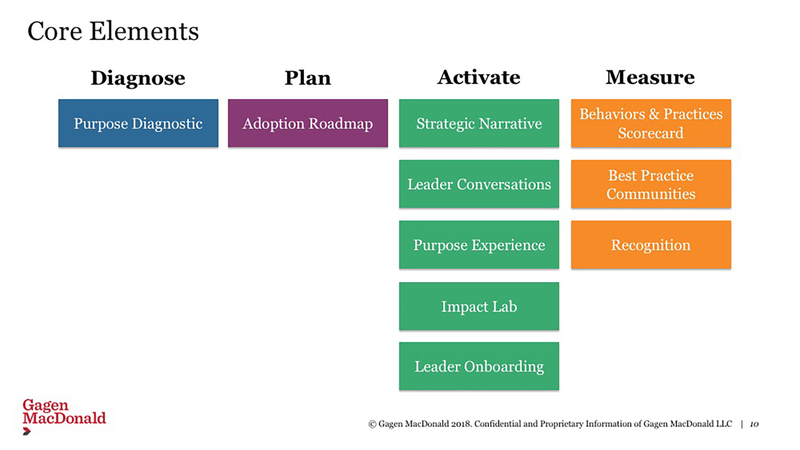 The core elements outlined below represent a subset of all possible levers companies can pull to activate purpose within the organization. Activation plans must be tailored to each organization’s needs and goals, but most will include these core components.